In the previous tutorial, we have covered important settings for how to add a signature in Outlook 2016 running on Windows 10 Windows 8 Windows 7 also use signature or make a custom signature on mail app for Windows 10. 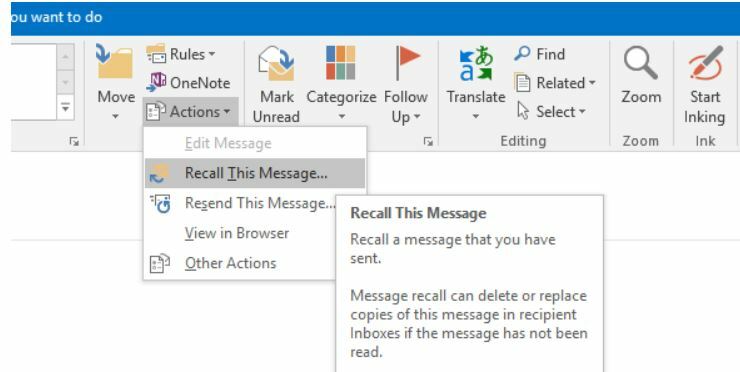 Right now I am explaining how to use recall mail features in Outlook 2016 users there are few conditions before we perform recall or delete mail from suspend mailbox. For the inconvenience, mac user doesn’t use or find recall mail in Outlook for Mac. If you sent a new mail message to the wrong ID or wrong person when you can remove from our end before message read or Open/view at the receiving end. Steps for how to recall emails? Open Outlook 2016 on your Windows system and select sent item folder on your Outlook next quickly open send message that you want to recall or delete weekly press double click to open it. Find the message cap at the top of the outlook option pane. Quickly click on actions > recall this message. You will see another option in the message box as a popup of Microsoft Outlook click on delete a hundred copies and replace with the new message or Delete unread copies of this message. Click on Ok to perform the task. Also, you can find the another option tell me if the request of stayed or fail for each recipient. This setting is very handy that makes sure and get confirmation the mail you have to recall is successfully done or not. The original message is moved from the inbox this can occur when rules are used. The receiver is using catch the action mode and its working offline. The original message is open low cost and market is the Read. Above is the fixes and guide for how to use recall on Outlook 2016, 2013, 2010 on Windows 10 running on laptop or PC.